2016 Credit Scores is one of the most important factors when looking to get qualified to purchase a home. Even though there are credit score requirements in place, there is a lot of confusion from potential home buyers as well as borrowers looking to refinance. With 3 different credit bureaus (TransUnion, Experian, Equifax) and FICO giving out credit scores, which is the score that you should use or be the most concerned with? Each of the 3 main national reporting agencies TransUnion, Experian, and Equifax are independent credit resources and therefore develop their own calculations and formulas to deliver a score to you. 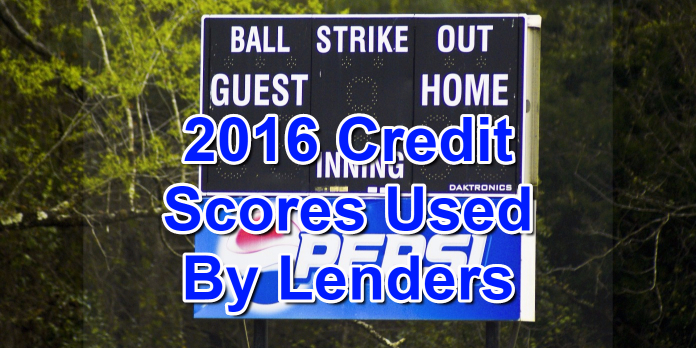 Lenders play a big role here in 2016 Scredit Scores and it is up to them to determine which score from which agency they will be using or even a looking at more than one score. For example, the lender who gave you your auto loan might have only used TransUnion’s credit score and credit report in determining credit worthiness while your 2nd car auto loan may have used Experian’s credit report and score to determine credit worthiness. When it comes down to mortgage lenders, they take a look at the entire picture from all 3 credit bureaus and they will end up using the middle score of the three. Mortgage lenders do not care which agency the middle score is with, all that matters is that it is the middle score. When thinking about 2016 credit scores, this will definitely affect you if you are a home buyer or looking to refinance. No matter what program you are trying to get approved under, there will always be a minimum credit score requirement. For example, FHA only requires a 580 credit score to qualify for an FHA Loan with 3.5% down payment. However, the 2 government sponsored entities Fannie Mae and Freddie Mac require a minimum credit score of 620 to qualify for a loan. In terms of Jumbo Loans, there isn’t a standard requirement, but most lenders will want to see a credit score over 700 before funding this loan. Alright, now let’s say you are ready to purchase or refinance a home and you allow for your credit to be run and it is as follows: TransUnion 650, Equifax 710, and Experian 730. Since the middle score is always used for credit score verification, the 710 score from Equifax will be the one used for qualification purposes. So as long as you are in a program with a minimum score of 710, you would at least have satisfied the 2016 Credit Scores requirement. If you feel that your 2016 credit scores aren’t strong enough to get approved on your own, you may choose or your lender may allow for co-borrowers be added to the mortgage. This is where it gets a little tricky in terms of which credit score to use so the one you will use is the lowest middle score. You may be asking what this means, so let’s look at it. After you know all the credit scores of potential borrowers, you need to compile all the middle scores and you will find they are 650, 690, and 675. After this, you will take the lowest of these three scores, so 650 will be the score that is used to qualify for the loan program. Navigating the waters of credit scores and co-borrowers can be tricky, but if you have an experienced loan officer on your side like myself, there is no need to worry. If you need help, please call me at 888-900-1020, email me at contact@loanconsultants.org, or visit my website www.loanconsultants.org.